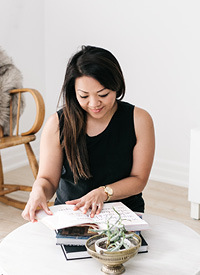 Fave Furniture Friday with Tiffany Leigh Interior Design — Love On Sunday Love On Sunday | Interior Styling in Toronto and the GTA. Happy Friday! Today I am so thrilled to be part of Tiffany's Fave Furniture Friday. Not only is she a talented Interior Design major, she's also an amazing artist. So be sure to check out her blog and read my guest post here. Lately I've been on a mission to try and help my parents update their home. They have bold red couches which originally killed me but now I'm thinking, this can work. I'm loving the navy and red combo. I think the colours are classic enough to take you from season to season, especially when you mix in some neutral colours like white and gold. You could even throw in a touch of teal to brighten it up in the Spring and Summer. What are your thoughts on this colour combo?